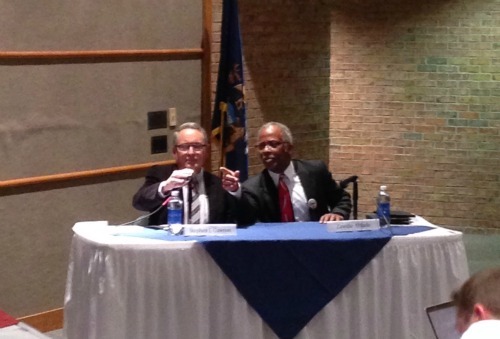 Muskegon’s two remaining mayoral candidates squared up in a debate at Muskegon Community College Wednesday, with discussions focusing on the economy, violence, the impending B.C. Cobb plant closure, and diversity. Dr. Zawdie Abiade, a family counselor, is challenging incumbent Steve Gawron, who has held the seat for the last year after Mayor Steve Warmington stepped down. A third candidate, Jeannette Moore, was eliminated in August’s primaries. The debate was co-sponsored by MLive and Muskegon Community College. The debate was moderated by Muskegon Chronicle reporter Dave Alexander as well as Muskegon Community College professor David Takitaki. Questions were taken from the Muskegon Chronicle editorial board, MLive.com and Muskegon Chronicle Facebook commenters. Opening comments varied dramatically between the candidates, with Steve Gawron sharing his long-term experience in the job, on the city commission, and as a community leader in the city. He painted a bright picture of Muskegon’s future, especially in terms of its economy. “The sores of the city are not part time problems,” said Abiade, suggesting he had more time than Gawron, who works full time as a probation officer for Ottawa County. Opening comments were followed by a question period, with different types of questions. Candidates were first asked questions with an opportunity for the other candidate to rebut. Then each question was asked a specific question about their candidacy that the other candidate was not allowed to respond to. Lastly, candidates were given a chance to ask their opponent a question. Both candidates declined to ask a question in this round. The four commission candidates that survived August’s primary will face off Thursday night at the college. How would you rezone the Sappi property? Abiade: Would rezone the property with multiple purposes, including commercial and tourism, possibly as a walkable extension of downtown. Needs to be more than a reshaping of the property, but a way to engage people inside and outside the city. Gawron: Said he has always been a proponent of rezoning in a mixed-use development, with residential, recreation and commercial uses that tie into the Lakeside neighborhood. An “improved hookup” with the bike trail would be important. What should city hall to support job development? Abiade: Said the city needs to be more on board with the idea of “smart zones” to help avoid “pathwork employment.” High tech jobs need to be prepared for now, and the city needs to “agitate and encourage not only the school system but students” by supporting the growth of these types of jobs. Gawron rebutted by saying the city is involved closely with the school district and governmental units in Kent County to position the city’s economy, especially in light of its plans for port development. If elected, how would you address urban violence, and how does the redevelopment and safety of city neighborhoods fit into your plan? Abiade: Stated he has been to the Wood Street Market and parks where shootings have happened and talked with those affected, getting to know them. He said the matter of solving the violence is not about sending the police on them, but through developing strong relationships. He suggested using block-sized groups within neighborhood associations to watch and keep track of what’s going on in their neighborhoods. Gawron: Stated he is a proponent of the “broken windows” theory, saying ill-maintained neighborhoods can attract negative behavior, and vice versa. He stated that the economic downturn caused the city to lose ground against crime, especially due to the cutbacks of police officers. He said the city is doing the best job possible, including introducing new mapping tools and cooperation with other agencies including the Social Justice Commission. Abiade rebutted by saying every city he lived in that had violence issues had something like a Social Justice Commission, but it would be until people got out into the field would anything happen. Gawron responded by saying the members of Muskegon’s Social Justice Commission were in fact active. What is your budget philosophy? What would you maintain and what would you cut. Gawron: Believes the days of federal support for local municipalities, like Community Development Block Grants, is nearly over. He said “ultimately, we’ve got to grow the economy” to assure the well-being of the city. Abiade: He said the city should revisit its master plan and reassess budget priorities based on that. He also stated that he would attract private funding for public projects, using the Muskegon Farmers Market as an example that preceded him. He also repeated his emphasis on Smart Zone work with colleges and universities. What is the city’s role in downtown redevelopment, and what policies would you suggest about that topic? Gawron: Said the city has had a major role already in downtown redevelopment, with a $500,000 donation to the demolishing of the Muskegon Mall and cutting the new streets into the site. He noted that he is a non-voting member on the Downtown Muskegon Development Corporation board, and said that the city is a major funder of Downtown Muskegon Now, the development organization focused solely on Muskegon’s downtown. “I know what Western Avenue was, and I am sure we will have a better one.” Gawron agreed with Abiade’s statement that redevelopment downtown should not be done at the expense of neighborhoods. Abiade rebutted by saying that ordinances in the city are “prohibitive” to businesses, and said he would like to focus on reworking those policies to be friendlier to businesses. Gawron claimed the city doesn’t have any laws more prohibitive than what the state requires in its uniform code. Since the lumber years, our waterfront has been a large part of its economy and culture. How important is the waterfront to our city’s future? 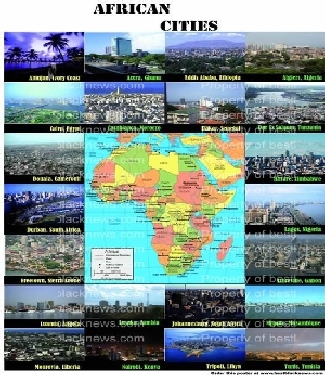 Abiade: Said it is very important, “in all capital letters.” He tied the water to the city’s identity, including the city’s budget and other governmental aspects. He said the city has a responsibility to the rest of the county and event the state to “set the pace” by using the resources it has. “We have a diamond we have not cleaned well, and our diamond is found in our water,” said Abiade. He said the city could piggyback off program’s like the State of Michigan’s “Pure Water” campaign. The B.C. Cobb plant is expected to close in 2016. That is a negative for this community, as it is the largest tax base in the county. What is city hall’s role in turning this lemon into lemonade? Abiade: Because it is a significant part of the city’s tax base, its future needs to be examined in light of the city’s master plan. Maintaining the property is not an option, and the city needs to be working on what’s next now and not in 2016. He stated that city hall has a very significant reason to be at the table, talking about the plant’s future and how it could be used going forward. Community members should be involved as well. Gawron: “We’re on it,” said Gawron. He stated the city has been communicating with Consumers Energy and working on the problem for several years, and is on its way to rezoning that end of Muskegon Lake for port facilities. He responded to Abiade’s idea about involving the public by saying Consumers Energy is a private entity and the land is private property, so they set the tone for how much community involvement will be allowed. Abiade rebutted by saying that neither Sappi, nor the B.C. Cobb plant are isolated issues, adding Fisherman’s Landing and other properties to his list. He said the master plan must be consulted as rezoning is taking place. Is there a racial divide, and if so how can the city deal with it? If not, how do you deal with the people who believe there is? Gawron: “At city hall, we won’t stand for a racial divide in our operations, relationships,” said Gawron. “We’ve done a great job at city hall mirroring the community at our highest levels,” citing department heads who “don’t look like” him. He said that the city must model that racism or bigotry are not accepted. Abiade: Thinks there is a racial divide, citing divisions on a neighborhood-by-neighborhood basis. He cited a company that recently received tax abatements, saying it was a “shame” that 49 of 50 people in the company were not minorities. The city has a responsibility to model the right behavior, even offering himself and his interracial family as an example. Bring people together by working with people of all backgrounds is important. Gawron responded to the tax abatement charge by saying the company in questin went through 500 applications, and could not find qualified individuals of any race. He said all companies that go in front of the commission for abatements must have an affirmative action plan and work with the city’s affirmative action department. Abiade answered by citing his own experience having a harder time finding a job than his white friends out of college, saying there is an unspoken divide that remains. In 1981, Marguerite Holcomb was providing leadership in the city. Starting next year, there will be no woman on the commission. Is that an issue for you, and if so, how do you respond? Abaide: He said it angered him and he was “very disturbed,” stating if he could step down and allow a woman to take his place in the mayor’s race, he would do so. He said he would have advocated for female candidates, breaking with the city’s tradition of its commissioners remaining neutral if not up for reelection. Abiade and Gawron both agreed that women and men have different perspectives on things and that perspective would be sorely missed. Abiade suggested a council of women to get their voices heard, and also place more women on citizen committees. Q: Why are you pursuing a seat seen by some as a figurehead? A: Abiade stated he is a high energy person and the role of mayor holds influence to clean up the “diamond in the rough” that Muskegon is, in his opinion. Q: You have been involved in city commission for a dozen years, and some would say not much happened in that time. As you move into a new turn as mayor, how would you do things? Gawron said he did not have a substantive question, but offered to meet with Abiade after the election, no matter who won. Abiade declined as well to ask a question because of Gawron’s choice to refrain.